BoLASEPaKO.com - a simple view on Singapore Soccer: "What next for Singapore Football?" "What next for Singapore Football?" Mr Terence Ong, who is now pursing a degree in communications wrote to me last November for some help in a school assignment he was doing. Reminiscing about the golden period of Singapore football from the 70s to the early 90s, the owner of a popular local football blog named BoLASEPaKO, has watched the growth of Singapore football ever since the Football Association of Singapore (FAS) pulled out of the Malaysian competitions in 1994. Since then, Singapore football has seen major overhauls in hopes of carving an identity out for the local football fraternity. However, it seems as if these changes have not taken flight the way it was supposed to. In the S-League season just passed, attendances sank to an all-time low while none of the trophies went into the cabinets of local clubs. 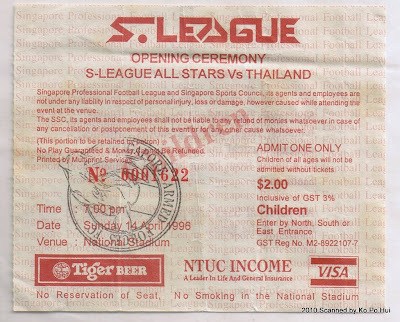 The S-League was started in 1996 as a footballing platform for Singaporeans after the permanent departure from competitions across the Causeway. Forming the nation’s premier football division then were 8 local football clubs with heartland names to allow fans to bond with it. Boasting players from the successful Malaysia Cup tournaments alongside foreign players, the league was first split into two stages with the two winners facing off each other before merging into the conventional league season a year later. The league took flight but could not sustain its growth due to the decreasing standards of football on show while also owing to the burgeoning presence of the major European leagues on the television. Hence, the league initiated drastic measures such as penalty shootouts at the end of drawn matches as well as inviting foreign entities to enter the league and spice up the quality – all these in an attempt to draw fans back to the terraces. The penalty shootout scheme was short-lived – lasting only a season before it was scrapped to the relief of fans and pundits alike – while the inclusion of foreign teams experienced varying success. Since Sinchi FC, a Chinese-based team whose name meant Singapore-China, became the first foreign inclusion into the S-League, a total of eight others have participated in the league. The number of ‘foreign’ teams becomes nine if you include the national Under-23 squad into the mix. Amidst the rojak of teams of different nationalities that is a reflection of Singapore’s population of sorts, there were the good, the bad and the ugly. 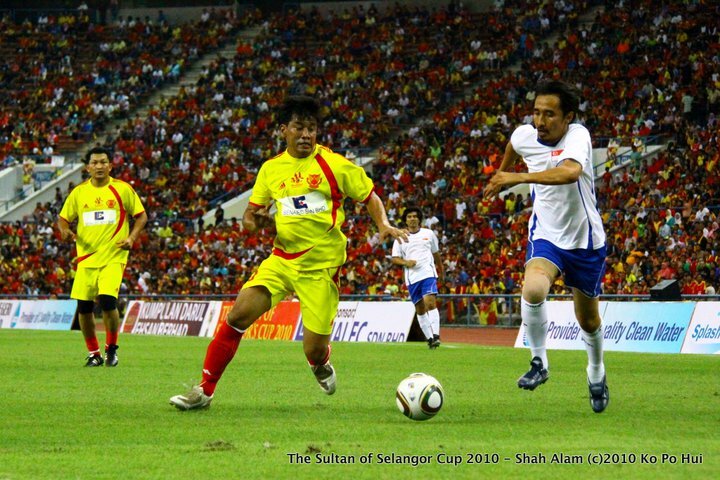 Teams such as Brunei DPMM (pictured above their fans in 2009 League Cup Final), Etoile FC and Korean Super Reds lit up the league and drew fans back to the games with attractive football displays that brought with it results. These teams eventually made history as DPMM became the first foreign team to win a local trophy and Etoile the first foreign team to win the S-League title. The bad were sides such as Dalian Shide Siwu FC and Sinchi FC who both failed to live up to their billings – promising so much yet delivering so little in terms of their footballing standards – while the ugly were teams like Liaoning Guangyuan and Beijing Guo-an Talents, both satellite sides of their parent clubs in the Chinese Super League who were found guilty of match-fixing and on-field brawling in their first seasons respectively. With the league essentially a provider of players to the national team, one fan believes that while the likes of Etoile FC have improved the reputation of the league and increase competitiveness amongst the teams, foreign inclusions are not necessary to the league for Singapore football to improve. Alhafidz, an avid fan of local football since the age of 10, feels that with improvement to the league standards, fans will come back to watch good football and the way forward for the local clubs, and essentially Singapore football instead, is not the inclusion of foreign teams but something else. It has been observed that there are two important qualities Albirex Niigata (S) (pictured above) have in abundance consistently as compared to others – commitment and desire. Being a satellite side of its Japanese parent club which plys its trade in the J-League, Albirex has an evergreen squad consisting of their academy students to whom an S-League season or two counts as their footballing education, after which they return to Japan and be replaced by new academy students. Unlike foreign players who come here as the finished article, the Japanese players are traditionally more hard-working and as they are playing for their careers, in hope of making the grade in the superior J-League back home, they are more dogged in their desire and it naturally shows in their performances. Ko sang a similar tune to that – citing the Young Lions class of 2006 who finished in a lofty 3rd position – and believes that the FAS can do much more for youth development than it already is doing. However, Singaporean parents are known to dissuade their children from pursuing a full-time career in sports, believing that harbouring ambitions of being a sportsperson is an unrealistic source of income due to the plentiful supply of athletes but only so little demand for them due to limited requirements in sports. A footballer himself who is a goalkeeper with the Newcastle United Singapore Supporters Club football team, Pok Kin Chi believes that parents can be convinced to ‘take the plunge’ of sorts and support their kids if there are any thoughts of being a professional footballer, despite the limited number of professional teams in Singapore. “Football, or any sports for that matter, is a lucrative market now. In Europe you see players being paid hundreds of thousands a week and there are actually players plying their trades over there. Realistically speaking for Singaporean players, there are a few of our national players plying their trades in Indonesia right now and if Hariss Harun is anything to go by, Singaporeans can be talented enough for Europe as well”. For the uninitiated, Hariss Harun (pictured above) is the record-holder for the youngest-ever Lion when he won his first cap for Singapore at the age of 16 years and 7 months. Harun was also voted Most Valuable Player at a recent training camp organized by European giants FC Barcelona and was offered a two-week trial with Chinese Super League side Shanghai Shenhua and did well enough to be recalled for a second trial. It has been well-documented in the media recently that many S-League clubs were barely keeping themselves in the green of business – within the midst of it all, losing their best players to foreign clubs offering better paychecks – and are requesting for the FAS to help them out financially. Despite the FAS initiating discussions soon with their main sponsor, the Singapore Totalisation Board, about more financial support, Alhafidz is adamant that there are other ways to ensure clubs stay afloat. With the looming financial discussions between FAS and their sponsors alongside the 5-year Strategic Plan set aside by the association which underlines youth development as a huge part of it, the future seems bright for Singapore football. But without money to make things tick, how can youth development take place without proper facilities, coaching and equipment? Alhafidz brought up the possibility of setting up the league with bigger Asian clubs in a feeder-club system just like in Europe. In European football, such a system allows powerhouses such as Manchester United and Real Madrid to send out their youth players to other smaller clubs to gain experience and see if they can be good enough for the rigours of first-team football. On the other hand, what the FAS has at its fingertips right now, and can do, is liaise with the Singapore Sports School and the Ministry of Education in changing the perception of parents who might have grown up wanting to be sporting athletes as well. Working with the education body of the Government and tying up links with the Sports School can further close up the gaps in scouting networks and yield more players for the league and ultimately, the national team. In the inaugural Youth Olympic Games recently – the Singapore youth team, aptly named the Cubs, won the hearts of Singaporeans with a thrilling run in the competition that almost ended with a first-ever Olympic gold medal for the republic. With the public interested in the Cubs, youth football can surely be tapped on by the association and further developed, with pundits and fans alike predicting a bright future for the Cubs. Imagine the possibilities if the FAS ran an intensive youth development programme modeled after the likes of Dutch champions Ajax Amsterdam, whose emphasis has always been on developing stellar youth talents for its first team. Ko, the ever-loyal football fan of the Lions, believes that there is a solution closer to home that no one else truly realize until a closer look is cast. With a revamped youth development programme in place, who’s to say that by the time 2015 comes along, we will not have more than 12 teams, more locals than before, participating in the S-League.